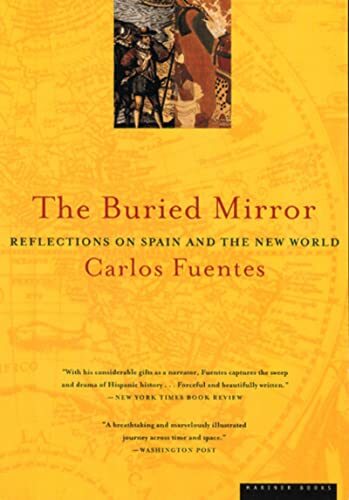 As the Los Angeles Times said: "Drawing expertly on five centuries of the cultural history of Europe and the Americas, Fuentes seeks to capture the spirit of the new, vibrant, and enduring civilization [in the New World] that began in Spain." Fuentes's singular success in this remarkable endeavor has made the book a classic in its field. (A Mariner Reissue). Carlos Fuentes is the author of more than a dozen novels, including Terra Nostra, The Old Gringo, The Crystal Frontier, and The Years with Laura Diaz, as well as numerous literary and political essays. He divides his time between Mexico City and London. A companion volume to an upcoming Discovery/BBC TV series, this passionate meditation on Hispanic cultural identity from Fuentes (Constancia, 1990, etc.) unfolds with all the color, urgency, and perhaps inevitable superficiality of a popular documentary. Taking as his canvas no less than the entirety of Spanish and Spanish-American history, from the cave drawings at Altamira to the tortured political landscape of present-day Latin America, Fuentes builds his plea for Hispanic cultural continuity around a cluster of vigorously poetic images, largely concerned with the matter of ``inclusion.'' In the pre-Columbian age, for instance, Spain, Fuentes says, then quite literally ``the End of the World'' and marked by the successive influences of Iberian, Celtic, Roman, Visigothic, and Moorish traditions, found its unique identity through an often reluctant embrace of ``the Other.'' Transplanted to America, this rich blend expanded to encompass varied African and indigenous Indian accents. And yet today, fragmented and unstable, Latin America still lacks a ``necessary vision of cultural, economic, and political convergences.'' Although deeply personal and frequently stirring as polemic, the book offers no more than an outline as history, punctuated by proud intellectual trivia (Spain established Europe's earliest parliaments; Santo Domingo was home to the first university in the New World) and nicely formed, highly subjective musings on art and literature. More troubling is Fuentes's continual reliance on glib generalization and stereotype (e.g., that Mexican revolutionary leader Benito Ju rez ``was the very embodiment of Indian fatality, Roman legality, and Spanish stoicism''). Odd, too, is the simultaneously forward-looking and conservative exhortation--that Latin Americans must ``create [their] own models,'' yet that they must search for these within an ``authentically Iberian'' tradition--which seems as much a reflection of the central dilemma as a solution. Strictly an introduction to a complex subject, but, in its yearning and contradictions, an unusually revealing one. (Illustrations--160--not seen.) -- Copyright ©1992, Kirkus Associates, LP. All rights reserved.